Jerry Siegel and Joe Shuster, two misfit teens in Depression-era Cleveland, were more like Clark Kent—meek, mild, and myopic—than his secret identity, Superman. Both boys escaped into the worlds of science fiction and pulp magazine adventure tales. Jerry wrote stories, and Joe illustrated them. In 1934, they created a superhero who was everything they were not. It was four more years before they convinced a publisher to take a chance on their Man of Steel in a new format—the comic book. The author includes a provocative afterword about Jerry and Joe’s long struggle with DC Comics when they realized they had made a mistake in selling all rights to Superman for a mere $130. 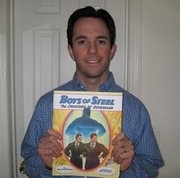 Marc Tyler Nobleman’s Boys of steel (Knopf, $16.99) captures the excitement of Jerry and Joe’s triumph, and the energetic illustrations by Ross MacDonald, the author-artist of Another Perfect Day, are a perfect complement to the time, the place, and the two young visionaries. Marc Tyler Nobleman's book Bill the Boy Wonder was available from LibraryThing Early Reviewers. Marc Tyler Nobleman is currently considered a "single author." If one or more works are by a distinct, homonymous authors, go ahead and split the author. Marc Tyler Nobleman is composed of 5 names. You can examine and separate out names.